A Proven Performing Time Clock with Enhanced Functionality for High Volume Applications! Time America’s TA785 Time Clock can record employee time, monitor productivity, control access and monitor inventory in a multitude of industries including restaurants, hospitals, health care facilities, banks, manufacturing, retail, hospitality, and many others. The TA785 time clock functions as a simple to use data collection point for employee information. It can be linked to a variety of existing computer networks in your organization to complement the management information systems you already have in place. By automating your data collection process, you can eliminate the manpower and mistakes associated with conventional time cards thereby reducing both payroll costs and errors. Communication between the TA785 time clock and your computer is accomplished by one of Time America’s polling and programming utilities or integrated time and attendance systems. The TA785 automatically transfers data to your computer. In turn, the computer is used to program the TA785. Each of the TA785’s 8 function keys can be programmed to ask up to four levels of information. Each piece of information can be validated and stored in the terminal’s memory until requested by the host computer. 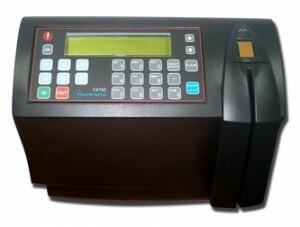 The TA785 can be programmed to prompt employees for data input, display employee messages, validate job costing entries, restrict employee punching via a schedule, regulate employee access to restricted areas, control a bell and much more. The TA785 collects this data and transfers it to your computer via RS232 serial, RS485 LAN, internal dial-up modem or Ethernet communications, whether wired or wireless. 2×16 Character LCD Backlit Display: The time clock comes with a highly advanced filtered LCD display. This means that under almost any lighting condition the terminal will give you a clear picture. The terminal supports characters such as <space>. Battery backed memory: The time clock contains a rechargeable back-up battery which provides over 2 hours of full operation during power failure. A warning indicator light on the terminals keypad alerts you to loss of line power. In addition, the TA785 has an internal Lithium battery keeping your data safe even if the power is out for weeks. The terminal’s internal Lithium battery not only holds the memory, but also keeps the time and calendar accurate. Data Input Validation: The TA785 time clock eliminates key stroke errors and increases job costing accuracy by allowing you to download tables of valid entries. When an employee keys or swipes a number, it is compared to the numbers you downloaded for validity. The terminal will correspondingly reject and accept entries, while optionally displaying the particular item name. Employees may also be restricted from entering unauthorized departments on an individual basis. Employee Messaging: After the employee enters their ID, the terminal can display a 16-character such as the employee’s name, hours worked, or location to report to. Messages can be personalized (i.e. “HAPPY BIRTHDAY”), giving your data collection terminal a human touch. In addition, message tables can be accessed through the terminals function keys. These message tables can be used to display information such as the employee’s hours, schedule and benefits balances. Strict Manufacturing Standards: Time America’s TA785 data collection terminals have been tested for optimal reliability. A high MTBF ensures virtually uninterrupted performance. The sealed keypad and the unique agronomical design reduce maintenance costs. The terminals are certified to CE and are manufactured to ISO-9001. Wi-Fi Wireless Communications: The TA785’s wireless card allows the 785 to communicate over a standard 802.11b network. The wireless network must be configured with an IP address, gateway, subnet, and WEP key (if available). P.O.E (Power over Ethernet): The TA785’s has the optional capability of drawing it’s power from the Ethernet communications line (Ethernet line must support POE)t This eliminates the need for high voltage power at the terminal location. Biometric Fingerprint Reader: The TA785 can store up to 9,000 Biometric Fingerprint templates for biometric verification (1 to 1) or identification (1 to many). The terminal utilizes a High resolution 500 dpi finger template.